Mmmm Mofongo - You're Making a Mess!You're Making a Mess! The first time I heard about mofongo was on the Food Network. The host was interviewing the chef at Benny’s Seafood (I’m guessing it was Benny) in Miami, famous for their authentic Puerto Rican fare. What struck me about Benny’s take on mofongo wasn’t the flavors, or colors, or textures — it was the way he put the whole mixture into a big cylindrical mortar and then used a baseball bat as a pestle, crushing the fried plantains and chicharrónes to a delicious mush. It just looked cool. 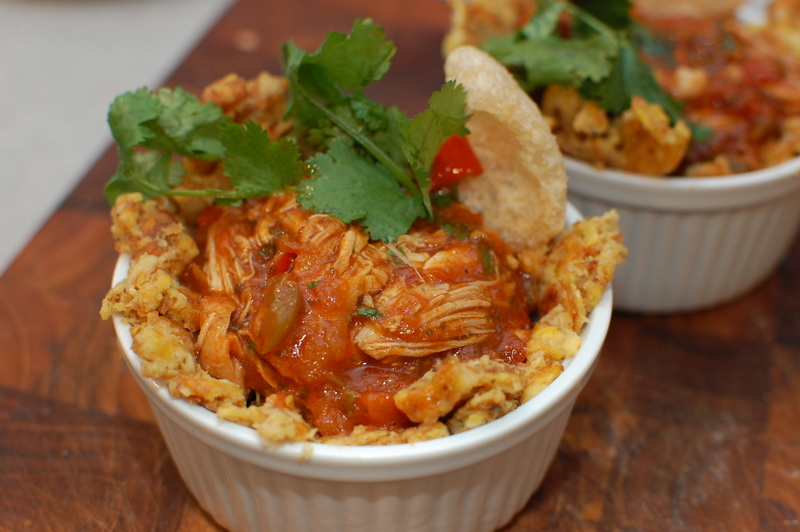 First, for those of you that missed that episode… what is mofongo? Mofongo is a dish made out of fried plantains, traditionally mashed together with fried pork skin. It’s popular in Caribbean cuisines, and I see it most associated with Puerto Rico. The plantains form a starchy base upon which a hearty protein is layered. In my case I added a creole-style chicken stew, but you’ll often see shrimp, pork or soup on top as well. My culinary foray into Puerto Rico began one weekend when I was trying to think of something relatively exotic to make. For a couple reasons, mofongo fit the bill, so after a bit of searching to find the perfect recipe, I was on my way to a local Latin American grocery store to get the ingredients. On the way, I made a call to a close friend of mine and Puerto Rican cuisine expert (hi Chris!) to get the inside scoop on the “right” way to make a proper mofongo. He suggested mixing a sweet (slightly more ripe) plantain in with the green plantains, and advocated topping it with either shrimp or chicken stew. Apparently the cool kids these days lean toward shrimp as a modern and slightly healthier take on a classic. Plantains, pork rinds, chicken, a banana, and sofrito ingredients in hand, I began following the recipe. 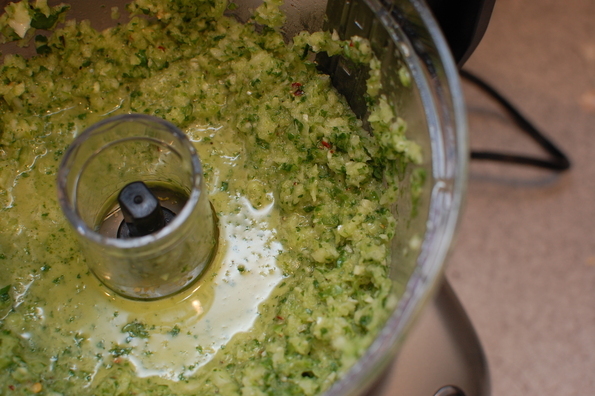 The first step, as Chris always says, is making the sofrito. Sofrito is the base of most Puerto Rican cuisine, and consists of bell peppers, onions, garlic and cilantro. It resembles (in spirit and composition) mirepoix in French cuisine, holy trinity in Creole cuisine, and probably a variety of other regional flavor bases. 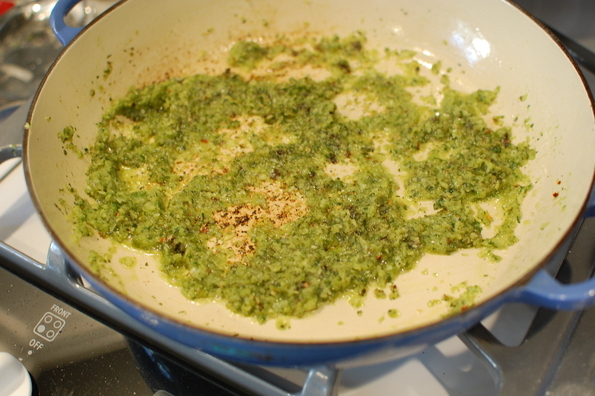 After assembling these ingredients and giving them a spin in the food processor, I cooked them in olive oil until they darkened slightly and started to form a fond (brown bits) on the bottom of the pan. 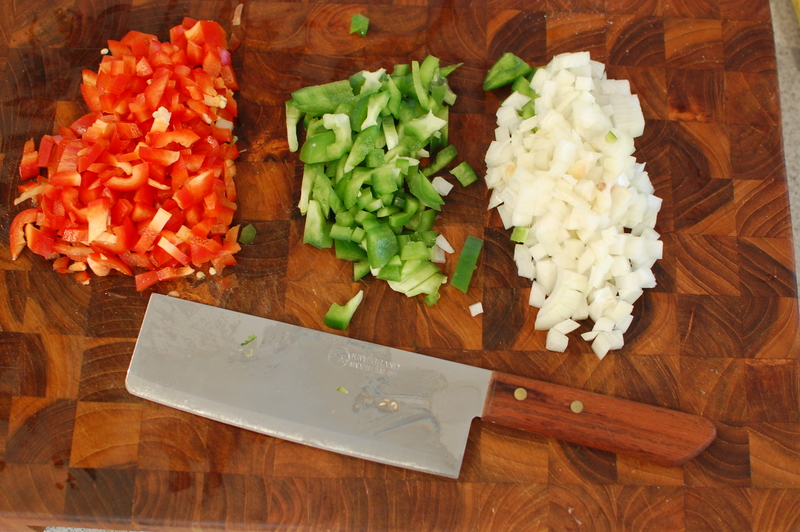 This is the base of the dish, and adds much of the structure and deep flavors, so whenever I cook sofrito, mirepoix, tomato bases or similar, I always make sure to take lots of time and get the browning right. As the sofrito was cooking, I took four bone-in, skin-on chicken thighs and put them under the broiler. Ultimately, I planned on cooking the chicken for a long time in the sauce, so my goal was to just get some basic browning (again, brown foods taste good!) on the meat before I incorporated it in to the rest of the sauce. After about 10 minutes or so, the skin on the chicken was a deep mahogany. 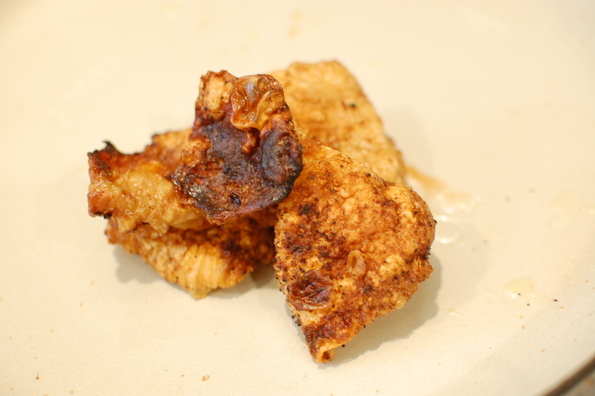 At this point, I changed my plans slightly — the recipe called for pork rinds to be mashed into the mofongo, but why not amp up the chicken flavor and use the crispy chicken skins instead? To get the crispness I was looking for, I removed the skins, gave them a few more minutes in the heat, then set them aside. The rest of the stew came together unceremoniously — if you’ve ever made stew, gumbo, or chicken the steps will be familiar. To the sofrito base, I added tomatoes, more bell peppers, more onions and some homemade duck stock (I was out of chicken stock) from the freezer. For even more flavor, I used more stock and tomato juice than the recipe called for, and reduced it down after everything came together. Next I added the thighs, cooked vigorously for about 30 minutes, then cooked it on low for a few more hours until we were ready to eat. Right before plating, I removed the chicken from the bones, shredded the meat, and mixed it back in. The last step was the mofongo itself. 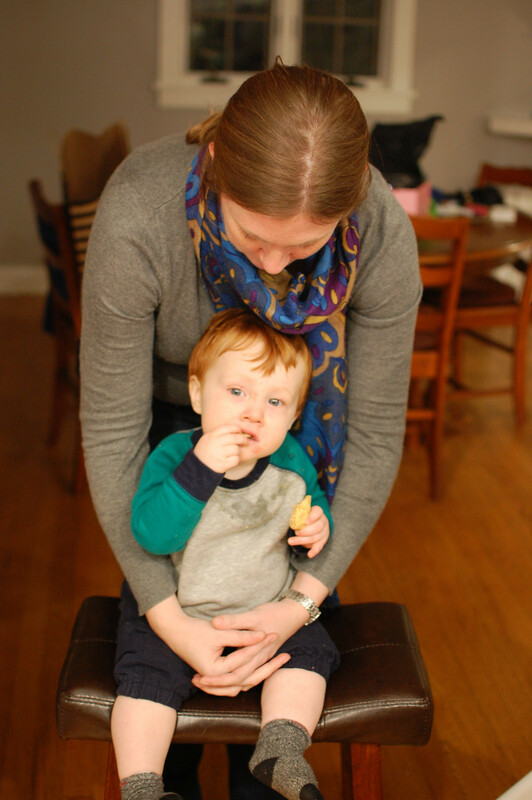 Plantains were a little tricky to peel at first, but once I got them going it was pretty easy. 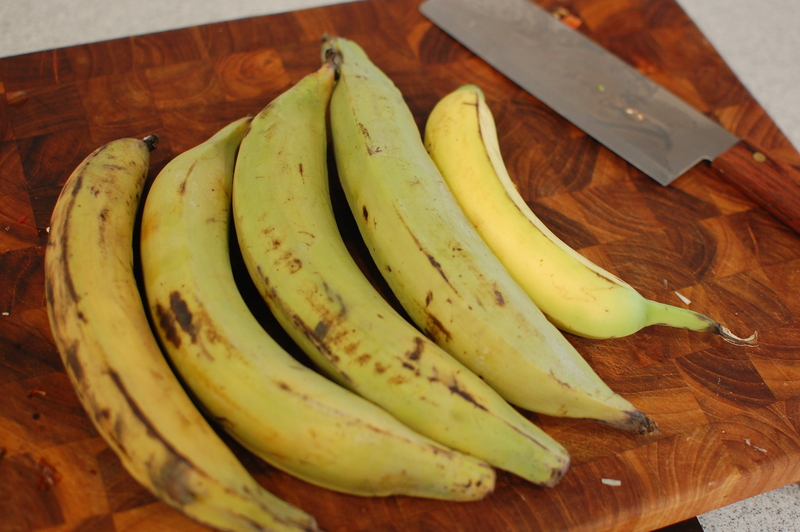 I had bought a banana at the store to use just in case none of the plantains had the slight sweetness that my friend had suggested, but fortunately they were all perfect on their own. I sliced them, and fried them in 375 degree oil in small batches. The small batches are important — it’s incredible how much the oil temperature drops with each new batch, even in a heavy cast iron pot. 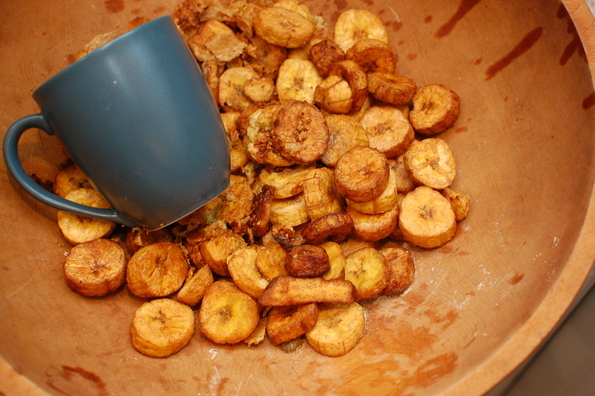 Once all plantains were fried, the last step before plating was mashing. I looked around and found a wood salad bowl that would act as a perfect mortar. Now I just needed the right club to smash them with. Since I didn’t have a baseball bat handy, I first tried the bottom of a glass (too dangerous), the side of a coffee mug with a handle (awkward and kind of dumb), and finally found the perfect smasher — a meat mallet (duh). I mixed in the chopped crispy chicken skin and proceeded to mash away. The mixture was a bit dry, so I added whole milk until I got the consistency I was going for (hard to describe, but much drier and lumpier than mashed potatoes). Final step — plating and eating! I formed the mofongo around the sides of a ramekin, ladled some stew on it, and dug in!